Large family ski apartment; sleeps 8 (max). Well equipped throughout with 2 bathrooms and toilets; dishwasher; wide screen HD TVs with FreeSat and DVD (UK and French TV) in lounge and bedrooms, WiFi available (at small supplement). Brightly decorated, complete with quality furniture. Comfortable beds with quality duvets and pillows. King size bed in main bedroom; 1 bunk bed and 1 twin bed in second bedroom; twin sofa bed in lounge; linen and towels available (at supplement). Ski locker. Fantastic location in private apartment block in Val Claret, Tignes; ski-in/ski-out; Easy access to lifts and ski school. Approx 2 hours 30 mins from Lyon and Grenoble; 3 hours from Geneva (slightly less now since the opening of the new motorway link coming out of Geneva). At 3,000m it is one of the highest resorts in the Alps - with over 130 pistes covering all abilities and 90 lifts. Excellent ski and snowboarding resort. Very long ski season (early December to May). Washing machine and heated boot rack new for this season. A superb, quality apartment with a 3 star/3pillow rating. Fully registered with the local tourist office. FREE Sportignes Activity cards in the summer, for over 20 activities from Archery through to sailing. You can reach us on UK zero seven seven seven one nine nine five four two seven or info at allezskitignes dot com - we love to chat thing through with our guests to make sure you are happy to book. Just a family, who happen to love skiing. Been going to Tignes for over 25 years - so know the area well. Call us on UK zero seven seven seven one nine nine five four two seven - and lets us answer your questions - we love talking about Tignes! Being able to put on your skis by the front door and have a choice of 6 ski lifts, all going in different directions, all reached with in a minute or two. Having over 300km of pistes in front of you, with 155 runs and over 90 ski lifts. Being able to ski back at the end of the day. Add in a nice, light, spacious apartment; shops and restaurants just along the road; ski school close by (no dragging kids on to busses or long walks with tired kids . . . ). toilet, combination tub/shower, With heated towel rail. Two large bathrooms, one with bath with shower over, toilet and basin plus ample towel hanging space; second bathroom with shower cubicle and basin and towel hanging space; separate toilet. Both showers have thermostatic valves - so not sudden cold shower shocks! Centrally heated thoughout with thermostatic controlled radiators plus electric heaters for use in the autumn. Available for a small surcharge. This is our own connection, not an external shared one. Well equipped with DVD and wide screen tv. Excellent collection of DVDs available for use. Large larder fridge with freezer compartment. Very well equipped - even down to sharp knives! We enjoy cooking - so we have made certain you have all you need. We have a pirade (hot stone) even a slow cooker. Large table with benches each side and chairs for each end. UK FreeSat TV and French Cable. Radio also via FreeSat. Many international channels vis FreeSat. A good selection available - great fun for family evenings! Extensive library for use - with DVDs suitable for all ages. Two balconies - one from the lounge area. This has a table and a couple of chairs. Second balcony from the second bedroom. Both with great views. Ski in/out; over 300km of pistes at your front door! A superb area for skiers of all abilities. We are less than 100m from the closest lift - and with a range of 6 lifts, going in all directions! In the summer - free with Sportignes activity cards, which can provide free of charge. In the summer - VERY challenging course! Well equipped kitchen includes ceramic hob and multi-function oven, microwave oven, toaster, kettle, coffee machine. Large fridge also has a small freezer area. WiFi is available for a supplement of £15 per week - please specify this with your booking. FreeSat TV provides the main English channels - it does not supply sports or films. French Cable TV. TV's also in both bedroom with DVD player, Playstation 2 and Wii. Small selection of games, books and DVDs. Ipod stand with speaker in living room. Bed linen and luxury towels are available for a supplement per person. Visit our website - www.allezskitignes.com for more information and photographs. Summer bookings include a free Sportignes card which entitles you to free activities including watersports, pedestrian use of lifts, archery, tennis and many others. Please see www.tignes.net for details. WASHING MACHINE/DRYER • HEATED SKI BOOT RACK - warm, dry ski boots in the morning! Bliss! A very helpful owner, who answered all our questions very quickly. 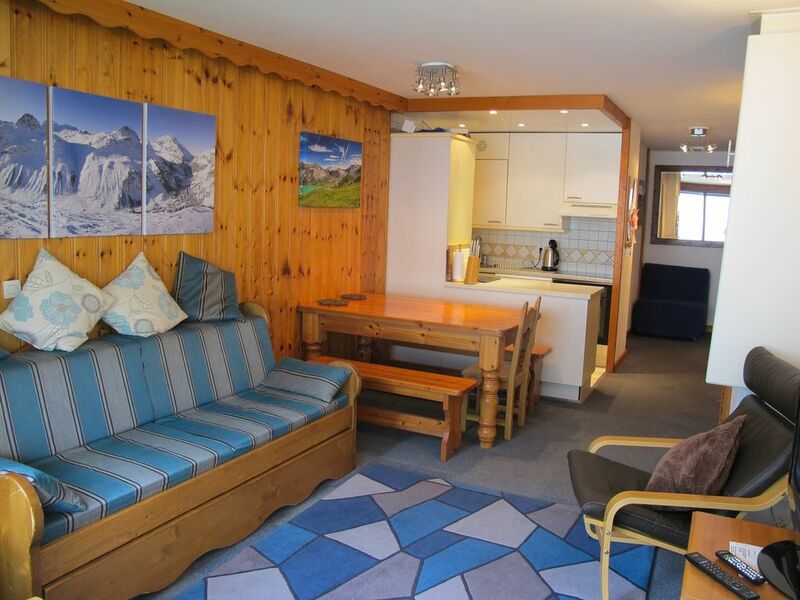 The apartment - nice position and so easy to get skiing from, with a lot of choices of lifts. Everything you could imagine you could need is provided - never been in an apartment like it! (Even had a mixer and weight scales in the kitchen). The Sonos speaker and the boot heater are nice touches. There were 5 of us - having two toilets and bathrooms was a luxury. Apartment was much bigger than we expected. Everything worked, the place was very clean - can’t fault it. If only more apartments were like this! Restaurants were good nearby; supermarket was ok but got busy late afternoon. We ate up the mountain most lunchtimes - overall pretty good and not too expensive. We had never skied the area before - was good to explore and discover. Will definitely be coming back to this apartment. Thanks for letting us rent - the place is a credit to you. Second stay - still great! Great location for Tignes and Val d'isere skiing. Cosy, well equipped, a great home from home. The heated boot rack is a real bonus too. Would definitely stay here again. Exellent location.Several skilifts just outside the front door. Very close to everything,but still in a quiet area. 2-3 minutes walk into resort center..
We liked that the layout of the aparment puts the 2 bedrooms (with 2 bathrooms!) at the opposite end from the living area,so if someone want to watch TV while others sleep it is no problem. Very well equipped with everything you will possible need and more! Good beds with proper duved,not blankets! Nice and warm even if we had -23C for a few days. WiFi fast enough for Netflix. Everything worked with no problems during our 14 day stay. Booking an payment trough Owners Direct is smooth and safe,no problems. The owner himself was very friendly an answered our questions via E-mail within a very short time. He also provided us with recommandations and tips all trough our stay. We arrived very late due to a problem with our flight but owner was still online and guided us to where the keys were and gave us directions to bus or Taxi. We really needed that at 00.15 at night in -17C after a 20 hour trip! All in all i can not recomend this enough! This is the kind of holiday apartment everyone wants to have,so if you are concidering this one,stop thinking and book! Tres bonne communication avec les proprietaires. Appartement idealement place (proche commerces, restaurants, remontees mecaniques, activites...), propre et tres bien equipe ce qui est rare. Le logement est grand et bien agence. Vous pouvez y aller sans crainte. Translated: Very good communication with the owners. Apartment ideally place (near shops, restaurants, ski lifts, activities ...), clean and very well equipped which is rare. The accommodation is large and well furnished. You can go there without fear. We had a great stay in Rogers apartment. It was clean and tidy and had everything we needed. You are about a 30 second walk from the slopes and a 5 minute walk to the shops. Had a great week in Tignes lovely apartment in excellent location. Very convenient for everything and very close to slopes. Rog (owner) very helpful and responsive with questions. Tignes Golf Club is the highest in Europe shared with several marmottes who make their home there. With its 18-hole golf course it winds around the mountainside on 5 km of fairways, as well as natural obstacles highlighted by architect Philippe Valant, Tignes Golf Club is for both beginners and experts. 18 holes golf, Mid golf, Mini golf, Practice, Putting Green. 18 holes course - length 5005m, par 68. Saturday changeover. Initial deposit required to secure booking: 185€. Tourist tax per week per adult €5 (£4) A damage deposit of 185€ will be added to your final bill, this will be returned in full within 14 days of the end of your rental period, less any costs for damage to the property. Full payment for the rental and security deposit is required no less that 6 weeks before the commencement of the rental. We do offer linen and towel rental €26 per person - this is paid separately, direct to us - please ask for details when you have booked. If booked it will be left ready for you in the apartment.